← Spring IS here – right?? Today, for the first time in Asia, I got out on my own! While in Bangladesh, I was so well taken care of that I literally did not have a moment outside of my hotel room when I was alone. This was really for the best, since most of the time I was in places where literally no one spoke English. If I had gotten lost, I would have been hard pressed to even ask for directions. Here in Bangkok, I’m staying with friends and have been with them all the time. Since my friend Sean and his wife both had to work today, I had my first chance to wander unattended. 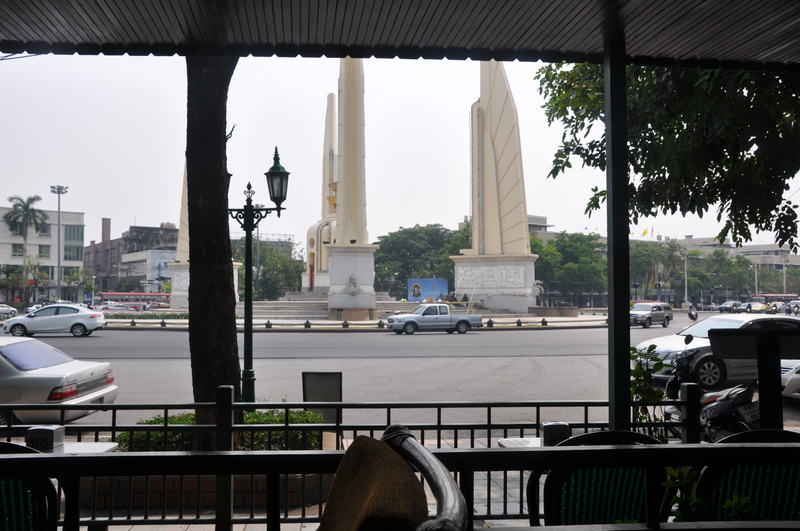 I accompanied Sean to his office and then struck out on foot for the area of the Royal Palace and the Sanam Luang ceremonial ground. 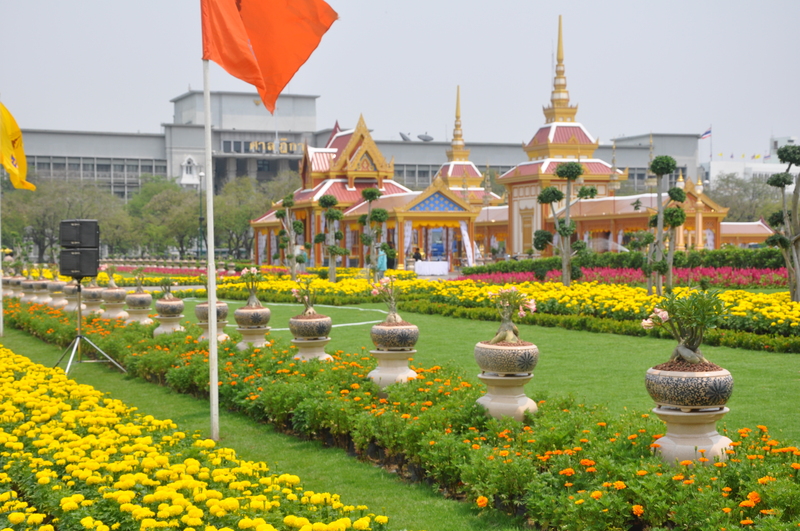 The ceremonal ground is a large open area in front of the Royal Palace. 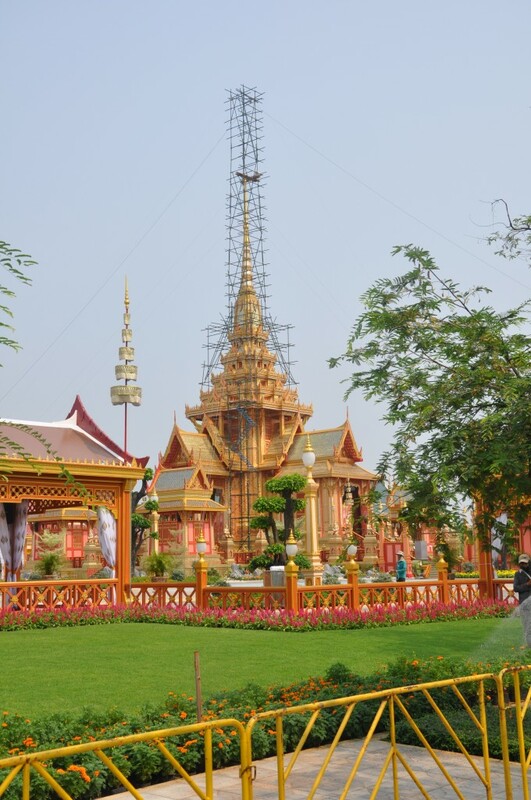 What is interesting about this area is that preparations are being made for the funeral of the King’ Cousin, Princess Bejaratana, which will be held on April 9th. The princess passed away last summer, but the norm here is for royal funerals to be held much later. Elaborate preparation is made for them, including the construction shown in the following picture. The funeral will include incineration of the princess’s body. 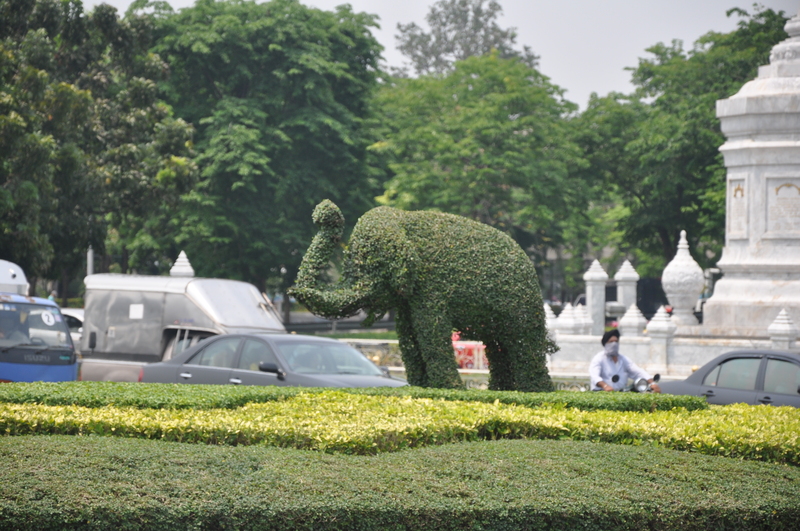 I spend most of my final day in Thailand walking around the area of the palace. Up at 3:00am to get to the airport for a 6:00am flight to Tokyo – the first part of my journey home. Though an early and fairly long flight (six hours), it was uneventful. In Tokyo things started to unravel with the cancellation of my flight from Tokyo to Chicago. This was the start of a new and unappreciated adventure, as I neared the end of my journey. I was re-routed on a flight to Houston, from where I was scheduled to fly to Dallas and then on to Lexington. I arrived in Houston about the time that storms and tornadoes hit Dallas, shutting down the Dallas-Fort Worth Airport. After a two-hour delay I was able to fly on to Dallas only to discover that my flight to Lexington had been canceled. I was now stranded in Dallas, with no idea when I would get to Lexington. I ended up spending the night on a cot in the baggage area of the airport. The next day (Wednesday) I was finally able to get on a flight to Chicago and make a connection to Lexington, arriving home in the afternoon. And who should I run into at the Lexington airport but Lexington beekeeper, and Blue Grass Beekeeping association president, Chris Smith. She and her husband Larry were returning from a trip out west. I was beginning to think I had left all my good karma in Asia, but felt something must be right when the first person I saw in Kentucky was a beekeeper. So, weary (after 48 hours of flying and sitting in airports) but happy to be home, I concluded my adventure to the far side of the world. I will be using my experiences in Bangladesh as the basis for future talks at beekeeper meetings and will continue to post photos on this webpage in the weeks to come. Welcome Home Phil ! Thanks for the pic of Thailand. I remember well. Hate to hear about the return trip home, but the pictures were gorgeous! Thanks for posting!